Eat your greens the easy way… Learn how to make the best tasting green smoothie ever! 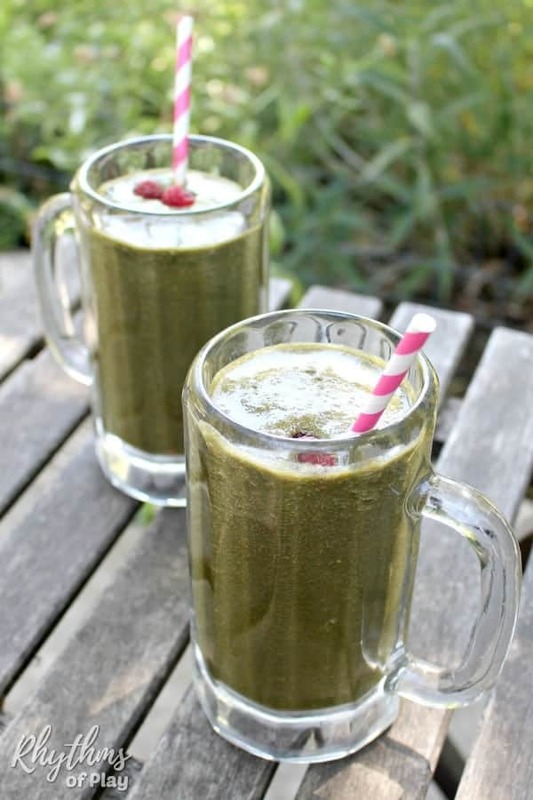 Green smoothies are a healthy meal replacement for breakfast the whole family can enjoy. Use these kid-friendly green smoothie recipe tips and tricks to design a green smoothie recipe so good, even your kids will beg for more! I’ve been making and enjoying green smoothies of all kinds for over 15 years. Some of them are tolerable, others are pretty good, and the rest are downright nasty! This is the best tasting green smoothie recipe ever… because you get to create it! Find my families favorite green smoothie recipe, and all our tips and tricks to design your favorite green smoothie recipe below! Related: How to Turn Pasta Sauce into a Healthy Meal Kids LOVE! The Best Tasting Green Smoothie Ever! I’ve converted all of my friends and family over to green smoothie drinkers using these tips. I’ve even managed to convince my father to fall in love with green smoothies, and he hates fruit. Strange, but totally true! Before I share my favorite recipe I want to give you some tips and tricks so you will know how to make all green smoothies taste great! After a lot of trial and error, I have discovered that adding acid fruits and healthy fats to your green smoothie is what makes a green smoothie taste fantastic! I know adding fats can be scary for many people, so let’s start with the fruit. When adding fruit to a green smoothie, it is best to use acid and sub-acid fruits rather than sweet fruits. Yes, you can still make a green smoothie taste good using sweet fruits, just make sure you add in an acid or sub-acid fruit in order to cut the green taste. Sweet fruits will make your smoothie sweet, but they will do nothing to counter the green taste. Acid and sub-acid fruits and fats used in the proper combinations will make your smoothie taste so good you will forget that greens are in it! The problem with green smoothies is that they are often a high glycemic food depending on what you put in them. That means that they send a lot of sugars into the bloodstream which is not good for the body. To counter this, make sure you add a high-fat fruit, and/or some healthy fats to your green smoothie recipe to slow down the glycemic index. High glycemic foods cause weight gain. Adding fat to your green smoothies will both slow down the glycemic index and leave you feeling more satisfied after you drink your smoothie. Don’t worry, adding fats to your green smoothie can help you burn fat. If you do not eat fats… your body will store the sugars as fats instead. Yes, really! You can use whatever green you like in your green smoothies. We most often use spinach, collard greens, and/or kale. We have also used dandelion greens, chard, and beet tops. Spinach and collard greens produce the mildest most tolerable green smoothies while kale and especially dandelion greens can be a bit strong and bitter for some. Need a green smoothie that will help you detoxify your body? Use dandelion greens with a lot of acid fruits to cut the strength of the green taste! Don’t forget to add some of the superfoods listed below to your green smoothie detox recipe for an extra super powered detox punch. Add a superfood of choice to increase the health benefits of your smoothie. There are lots of options out there. Following are the superfoods I most often use to supercharge my green smoothies. This list of superfoods perfect for green smoothies is not exhaustive – there are many more superfoods out there. I am only sharing the ones that I use in green smoothies. Green smoothies can be challenging for many blenders. Weaker models just can’t cut through all the greens and frozen fruits. We recommend using an industrial type blender like a Vitamix Blender , or a blender with an all-metal drive. We use an Oster with all metal drive that works fine, but many of my friends swear by their Vitamix or Blendtec . The Best Tasting Green Smoothie Recipe Ever! When I make green smoothies I don’t measure–I just throw everything in. The last time I made this smoothie I did my best to pay attention to how much I actually put in it. Use the measurements below as guidelines and make it your own. 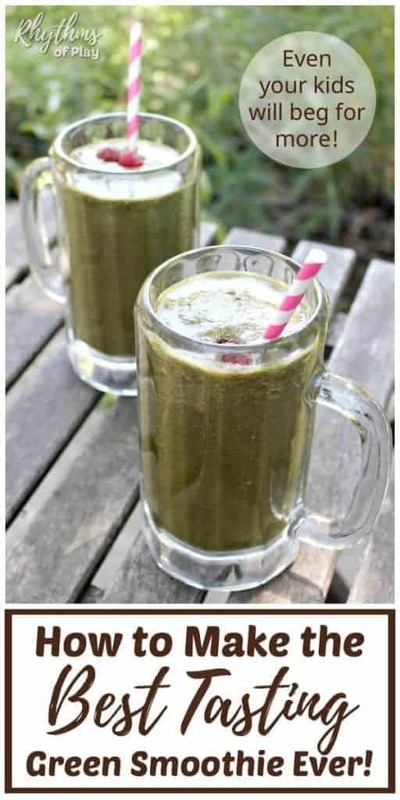 This green smoothie recipe serves 2-3 people. Sometimes I will switch it up by throwing some blueberries, strawberries, or mango’s into this smoothie, but the above recipe is my absolute favorite. I often use at least one frozen fruit to make it nice and cool. A warm green smoothie doesn’t taste very good. If you are using all fresh ingredients add some ice and/or place it in the fridge for a few hours to chill. How do you Save Green Smoothies and Take Them To-Go? 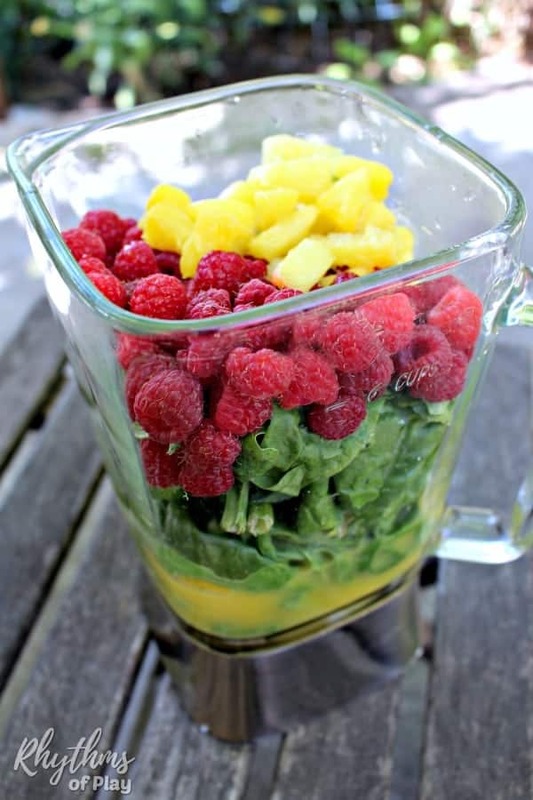 Green smoothies keep for 24 – 48 hours in the fridge. Place leftover smoothie in a canning jar with a lid and put it in the fridge for later. If you are taking your green smoothie to go, or packing it for lunch, use a thermos or a double walled stainless steel mug to keep cold until you are ready to drink it. Now that I’ve taught you everything I know about making green smoothies taste great I hope you will design YOUR favorite kid-friendly green smoothie exactly the way YOU like it. Don’t forget to pop over to have a look at more of our family favorite recipes. Now see, I KNEW there had to be a “method” to picking the right foods. Thank you so much for this post! Definitely saving so I can reference it later and LEARN what makes a good smoothie. Truly – I appreciate it!!! Found you on the IBN promo group today. 🙂 Have a blessed evening! Wow, what a post — that’s a very comprehensive write-up of ‘smoothie crafting’ with tons of information! Thanks Harriette – glad you liked it!